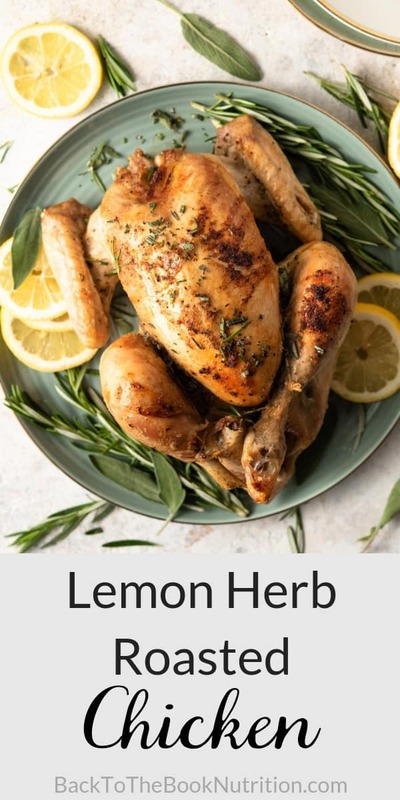 Easy, elegant herb roasted chicken with a rich lemon-wine broth and fresh herb blend. This chicken is so easy to adapt by using herbs you have on hand, or add vegetables for a 1 dish meal! I love the simple elegance of a herb roasted chicken. That crispy, herby, savory skin is so beautiful, and just exudes the warm feeling of a family dinner! 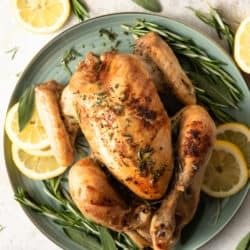 Of course, I also love that roasted chickens work beautifully with any herbs and seasonings I have on hand, and can be roasted over a pile of vegetables to make a one-dish meal. Earlier this week, I snipped a few herbs from the garden and grabbed some butter, lemon, and white wine, and went to town on a blank, 5 pound canvas of pastured bird from our favorite local farmer. 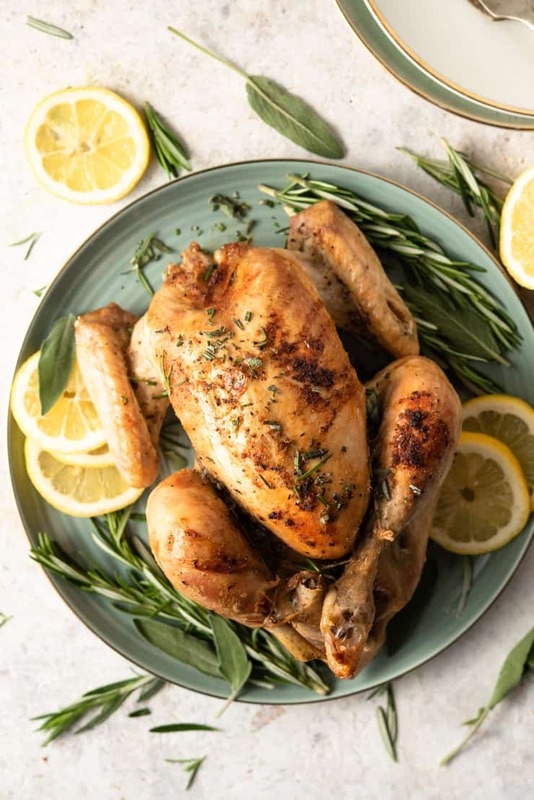 For faster cooking, the bird can be carved before seasoning and roasting – just place the lemon half and garlic cloves in the bottom of the pan with onions and place the legs, thighs, and breasts on top. 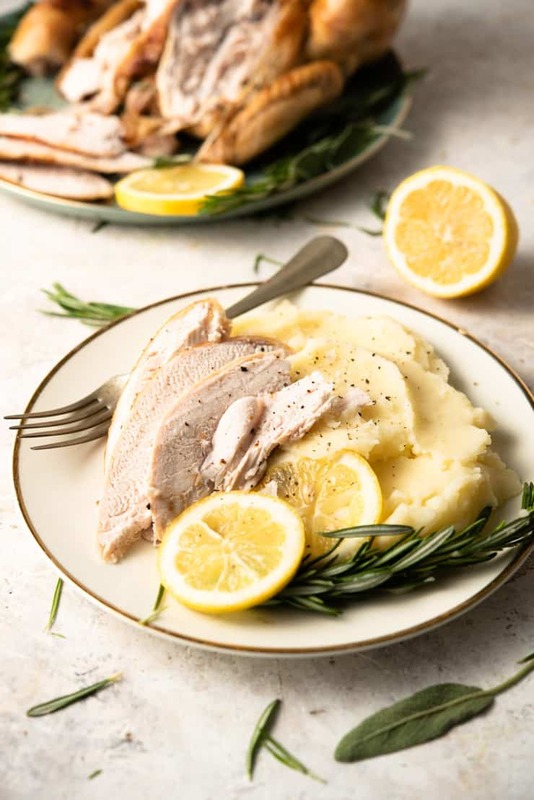 For a cozy and comforting meal why not serve this roasted chicken with smooth and creamy mash and a veggie side such as green beans or asparagus. You could also serve it with a big fresh salad and avocado if you want to keep things light and low carb. Next time I think I’ll add some halved red potatoes (and Brussels sprouts, maybe?) to the bottom of the roasting pan, because why shouldn’t the vegetables get to enjoy some of those delicious lemony-wine love drippings? Go high quality – I recommend going for organic free-range chicken raised on pasture by a local farmer for the best results, nutrition and flavor. Switch up the flavors – you can easily adapt this recipe with different herbs and spices to suit your mood. I wouldn’t recommend changing the lemon and wine elements too much since they’re the key to its rich, savory flavor! Not sure it’s cooked? – to be sure, always use a meat thermometer to check the internal temperature is 165F. Got leftovers? – leftover chicken will store really well in the fridge for 3-4 days or can be frozen. Leftover chicken can be used in so many ways from in salads, sandwiches, soups and stews – try my 20 minute Chicken and Rice Soup or my Easy Rotisserie Chicken Salad! Don’t forget to make stock – the best part about making a roast chicken is that no part goes to waste. Use the leftover carcass to make the most delicious and healthy broth or stock that can be used in soups, stews, and risottos. Easy, elegant roasted chicken with a rich lemon-wine broth and fresh herb blend. Remove giblets and rinse inside of the chicken with water. Place half of the chopped garlic and half of the lemon inside the bird. Scatter onion slices and remaining chopped garlic around bottom of a roasting pan and place the chicken on top. Melt butter/ghee in a glass bowl. Add the white wine as well as the zest and juice from the remaining half of a lemon. Pour the mixture over the chicken and onions. Sprinkle the house seasoning and chopped herbs over the chicken. It will look like too much of the house seasoning, but it's just right, trust me. Cover and cook 45 minutes. Remove from oven and turn heat down to 400 degrees. Reserve the foil for later use. Baste the bird with juices from pan, and continue cooking, uncovered, for an additional 15 minutes or until the surface is golden and a thermometer inserted into the breast reads at least 160 degrees. Remove from oven, cover with foil and allow to rest for 10 minutes. Thermometer should read at least 165 degrees. Cover with foil or roaster lid, and continue cooking for 15-30 more minutes, or until thermometer inserted into the breast reads 165 degrees. 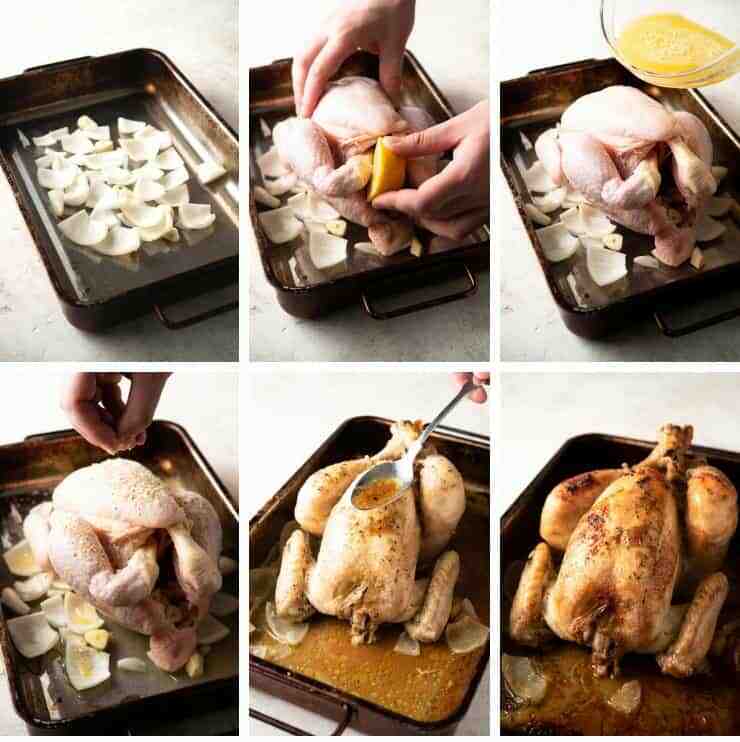 Remove chicken to cutting board to carve. Place carved chicken on a serving platter and ladle juices* and onions over top. Garnish with additional lemon halves and fresh herbs, if desired. *Optional: Strain juices through a mesh sieve and thicken with flour, etc. for a thicker, gravy-like consistency. Go high quality - I recommend going for organic free range chicken for the best results, nutrition and flavor. Switch up the flavors - you can easily adapt this recipe with different herbs and spices to suit your mood. Got leftovers? - leftover chicken will store really well in the fridge for 3-4 days or can be frozen. Leftover chicken can be used in so many ways from in salads, sandwiches, soups and stews. Why not try my Easy Rotisserie Chicken Salad! Don't forget to make stock - the best part about making a roast chicken is that no part goes to waste. Use the leftover carcass to make the most delicious and healthy broth or stock that can be used in soups, stews, and risottos.